I think Latitude 38 Vacation Rentals is heads above their competitors. Their website showcases their properties in a very user-friendly way. Our property was ideal and was exactly as the website described it would be. But my favorite part was working with the Latitude 38 staff. The few times we spoke by phone, they were very warm and professional and eager to help meet our needs. Overall, I can't imagine using any other rental agency again. Telluride and Latitude 38 Vacation Rentals won my heart. From the moment we connected via email and then telephone,the experience was terrific. The rented condo (penthouse) was perfect for us and couldn't have been more centrally located. It was reassuring to know that your office was right across the street. You were there to greet us and handled our requests promptly, esp. with the ski passes. Thank you! Great location near the market. Allison helped us with the snowmobile outfitter and made a great recommendation. She also helped us w a ski butler and lift tix in advance which made our stay easier. The house was very nice, however the parking situation should be improved. For a house that sleeps 14, there will be 3 cars and they will probably be large SUVs. The very steep entry into the garage would have caused us to damage the ski rack on the rental had we not had two spotters helping while backing the car out of the garage. The 3rd car had to park on the steep incline, and all 3 cars spun their wheels while trying to back out of the driveway. This was okay with dry pavement, but easily could have caused damage to the rental vehicles or the house / garage entryway had there been even a bit of snow, rain, or ice on the ground. The silver coffeemaker did not work, but fortunately there was a spare which worked fine. Other than that, everything was great. The Bachman Village house was comfortable and convenient for our stay in Telluride. We loved the close access to the Galloping Goose transportation bus. The house was also close to Clark's Grocery Store. The open field nearby provided lots of opportunities for Snowmen and Snowwomen building. I was having so much fun that I stayed an extra day. Latitude 38 staff was great from the moment I arrived on the property and through out the stay. Also, I really researched lift ticket deals this year. Latitude 38 was able to surpass any "deal" that I thought I had found. Just ask. Communication with the staff was excellent. I called to book as I was unclear on the differences between a couple of condos and the staff was very helpful. I received an e-mail a few days before check-in which clearly outlined the procedure. It was nice to go directly to the condo and not have to do an intermediate stop at a rental office. The team at Latitude 38 went above and beyond to ensure our first visit to Telluride was exceptional. From help with restaurant recommendations based on our picky tastes to providing a locals knowledge of Telluride's ski slopes (powder stashes!) and even clearing up a lift ticket misunderstanding with Telluride Ski Resort, the Lat 38 staff fully exceeded our expectations. 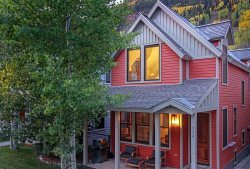 The property we rented for the week was perfect for our needs and I felt was a great value relative to other properties in Telluride. The bathroom and kitchen were beautiful and were plenty large enough for a comfortable week-long stay. And the near 360 degree views from the back deck are just spectacular....morning coffee with sunrise views over town and Ajax peak. Latitude 38 makes everything easy - they are friendly and available to support you in any way you can imagine to make your stay feel like a true vacation. Latitude 38 was great--always responded quickly to calls, had great suggestions to make the visit go smoothly, and were cheerful and flexible to deal with. Highly recommended. We've rented many condos in the past, and this one was excellent. It's got a great location, in overall great shape, very tastefully furnished, the kitchen is ideally equipped (we cooked every day), and there were small details (e.g. several iPhone-compatible radios) that were really nice.